Departement of the Hautes Alpes - Population : 335 inh. 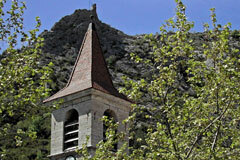 - Altitude : 698 m.
30 km au North-West of Sisteron, via the D4075 and the D30. 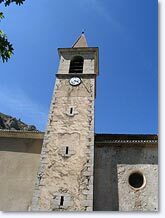 Nestling at the foot of rocky crags, impressive vertical cliffs and located on the "Road of the Princes of Orange", Orpierre is a real village of the South, with its little square shaded by plane trees and limetrees, occupied by nonchalant boule players, and its pretty church with its round apse. 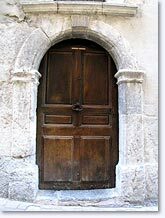 Historically, Orpierre was successively a stronghold for the Dauphinois, Burgundy, Germans and French (in 1713). 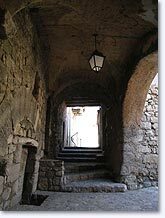 However sometimes all that's left is a Renaissance façade with nothing behind it: an imposing fountain, a seigneurial prison, a "barral" oven which everyone could use to bake their bread, provided they paid the oven taxes, old beautifully proportioned doors (17th century), numerous vaulted archways and covered passageways. Don't forget to take a look at the Chalon-Arlay house (1334-1530). If you simply walk along La Grand Rue, and then through the "quartier des Manants" (peasants' quarter) you'll take an unforgettable journey through time. 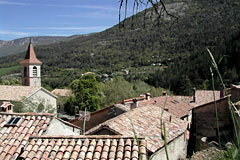 Even from above, Orpierre is a delight to the eye, with its Roman tile roofs, with vertiginous rocky crags in the background. 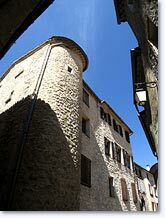 Orpierre is not to be missed if you like old buildings ! Hiking (470 km of waymarked footpaths in the Buëch area). Mountain-biking. 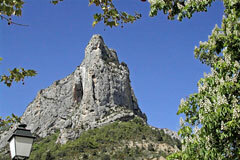 Gites, hiking gites, farm gites. Lagrand (7km) and Laragne-Montéglin (13km).